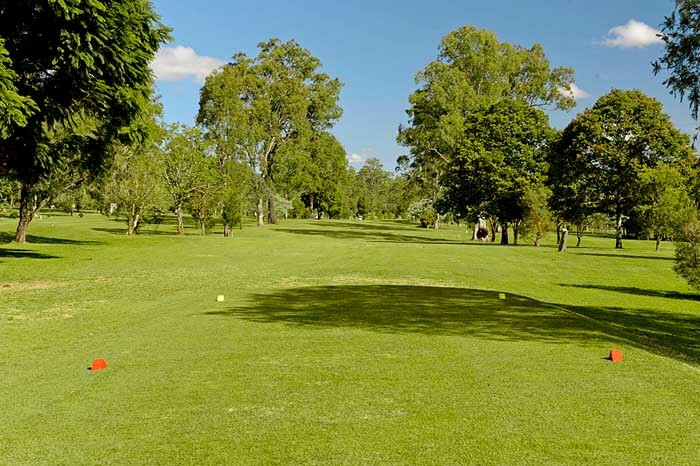 Our shortest Par 4 the fairway is again an avenue which tends to keep things tight and with a left to right slope thrown in the second shot can be a challenge. The green is covered to the left by both large overhanging trees and a bunker while the right slopes steeply down to light rough and shrubs. The green is two tiered with a pronounced ridge running across the putting surface. The 11th is the shortest hole on the course but if you do not hit the green it usually spells trouble. Too short and you are in the water that lays across the front of the green, even if you do make it to the front of the green there is sandy rough and a steep up slope to contend with. Too long and you have to contend with steep humps that make stopping a ball coming back onto the short wide front sloping green a challenge. Only 3m shorter than the longest Par 4 we have but plays longer due to the slight uphill gradient all the way to the green. 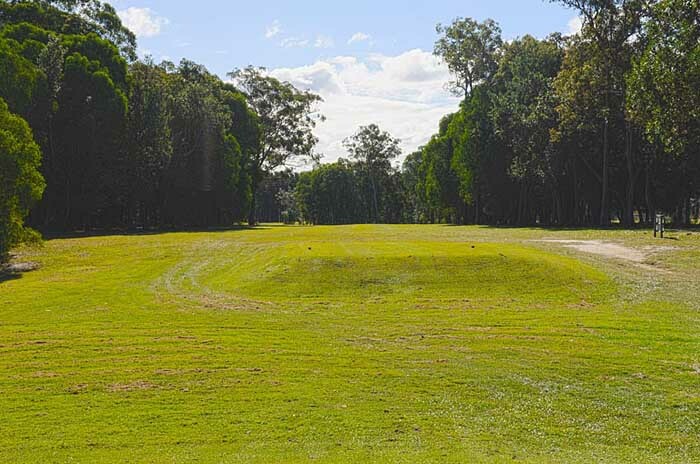 A flat fairway again lined with large trees for the full length makes straight hits a must. Across nearly the full width of the front of the green is a large bunker which makes the choice to go or lay-up a difficult one. The large green with some heavy undulations makes for some very challenging putts. This hole deserves its index 1. 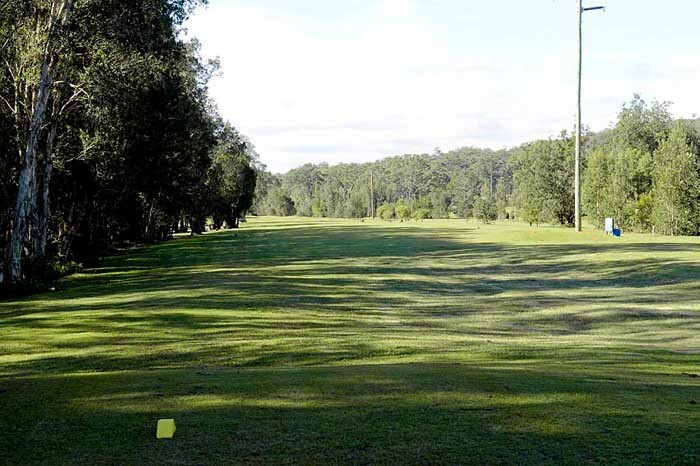 From the tee on the 13th you are confronted with heavy scrub on the left down a steep slope onto some flat with a dam again on the left and large trees on the right. The second shot is blind over a rise with a slight dog leg to the right and a large tree encroaching on the right at the turn. 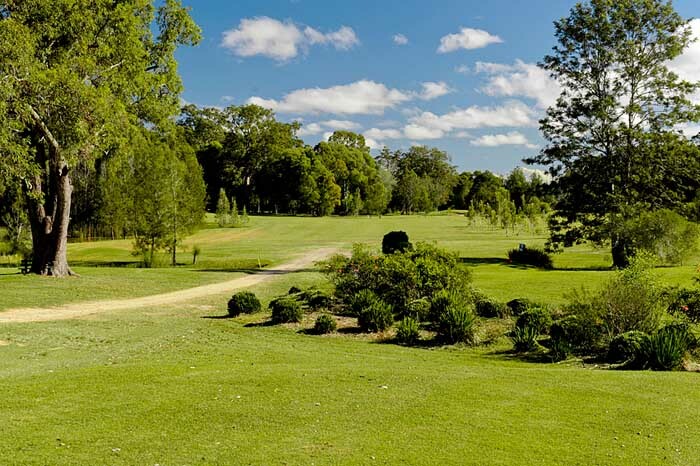 The fairway here is well guarded on the right by shrubs and a copse of small trees while to the left is heavy bush and another dam. Here the fairway also has a right to left slope and shallow gully runnning across it to make a flat stance a rarity. 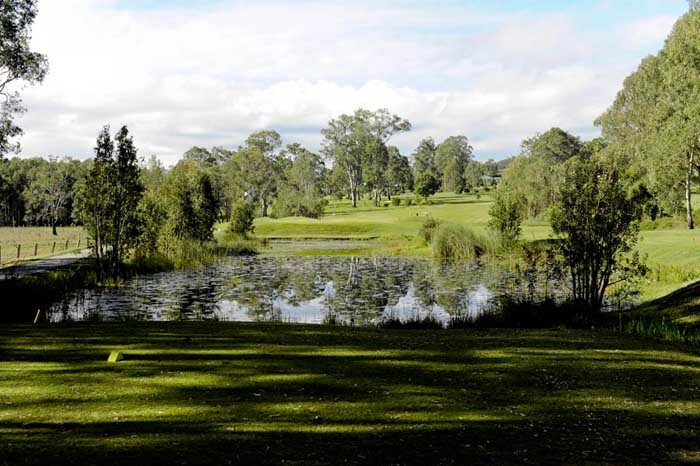 In front of the green to the left is a large flat area but the right has a deep bunker and severe undulations.The left hand side of the rather long green has another dam covering its full legth. The green itself has a back to front bias with enough ups and downs to keep you honest. The 14th starts with a drive out onto a broad flat fairway with shrubs on the right and water to the left. Big hitters can get into trouble running out of fairway with the sharp left dog leg. 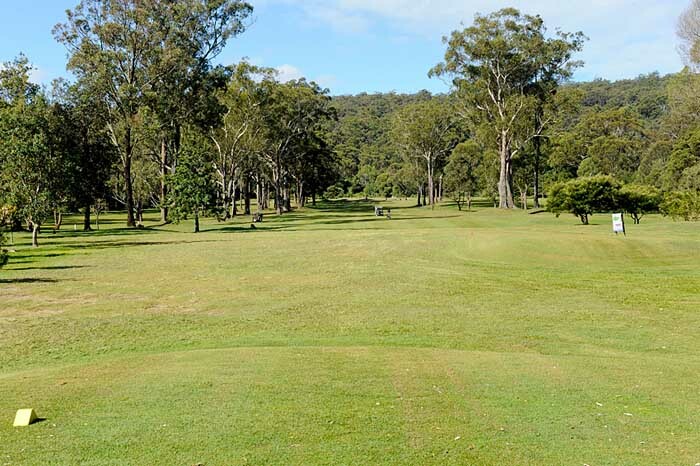 After the turn it is up hill past a large tree on the left to a flat, both sides of the fairway has trees and bush and the left slopes steeply down into heavy scrub. The large green is protected on the left by a steep slope and two bunkers, one to the left front the other midway along. 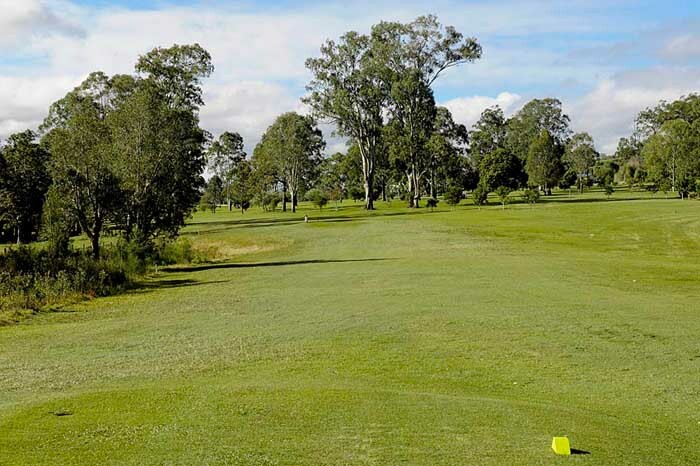 The 15th at Maclean is a challenge in that it is a fairly narrow fairway flanked on both sides by heavy trees and bush with a large tree encroaching on the left at the start of the dog leg. 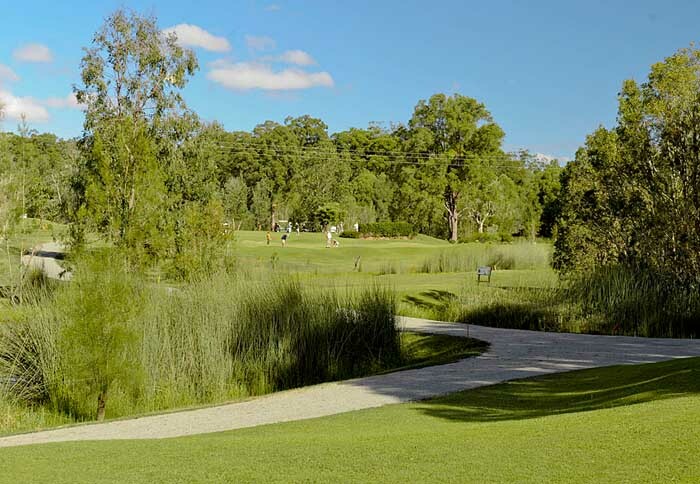 Once passed the dog leg it is down hill to a narrow section with water to either side about 30m shy of the green. The green is heavily guarded to the right with two bunkers and on the left are steep rises and slopes and then water. The green itself is large with a back to front slope and some pronounced rises and falls. The 16th from the tee looks easy enough with a dead straight flat fairway with trees to the left and a few shrubs to the right. It is the next shot that causes all the strife - layup or go for it. The green is basically on an island with a creek across the front which flows into a pond which guards the left. To the right is a narrow causeway between the creek and another pond and a sand bunker to the right front of the green - at times a saving grace. The rear of the green has another water feature. 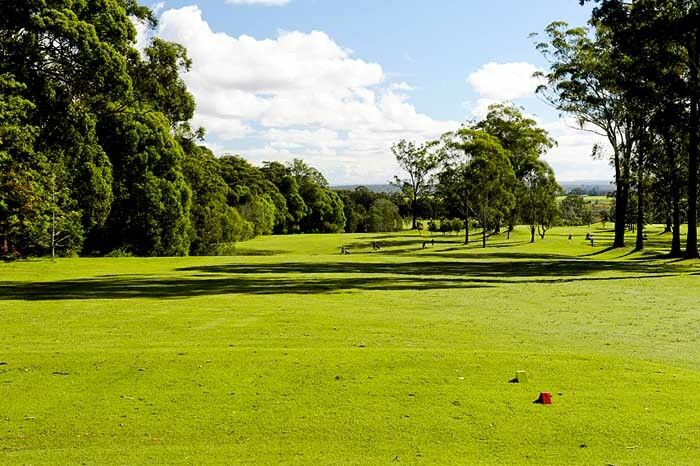 All sides of the green have steep slopes which help channel your ball into the water, the green itself slopes gently from the back to front. The 17th at Maclean is a picturesque killer of a hole (23 strokes is the current record). The golfer is faced with a full length water carry to a raised green with out of bounds to the left for the full distance. All sides of the green are steeply sloped with heavy grass cover. The putting surface has a swale running half way across the green to the right (Death Valley) making for some difficult putts. The longest hole on the course, the finishing hole at Maclean is out of bounds to the left for the full length. From the tee it is uphill to the left dog leg which has trees to both left and right. From there the fairway is dead straight all the way to the green with a gentle right to left slope to about the 100m mark from which it is relatively flat. The green itself is large and flat with a bunker to the left, reasonably flat to the right and a slope to the rear with OOB near the shed. For more photos of our course please visit our Facebook page.